In the project’s “450 years together. Jewish culture in Latvian environment – arts, music, education” Nr.EEZLV04/GSKA/2013/02 boundaries an exhibition by Latvian artist Joseph Kuzkovski was open to public in Riga Ghetto museum (Maskavas 14a, Riga) on May 26 – June 29, 2015. Joseph Kuzkovski was an outstanding Latvian artist as well as dissenter and member of Jewish underground movement during Soviet period of Latvian history. His paintings reflect tragic fate of Jewish people in 20th century. Joseph Kuzkovsky (Born Belarus, Mogilev, 1902; died Tel-Aviv, 04.01. 1970. ), a painter, film designer and graphic artist. In childhood attended cheder. For a short time, he was working as a painter in the studio of shop signs. Participated in the First World War. Volunteered for the Red Army in 1918. After the demobilization, he lived in Kiev. In 1927, he took classes in the painting workshop of famous painter Ash, in 1927 graduated Kiev State Art Institute, from 1929 to 1939 he worked at the Dovzhenko Film Studio in Kiev. In 1938, he created the first well-known paintings such as “Meeting with the Jewish agronomist of the Jewish collective farm”, “Competition on the farm.” This picture, as well as the others, were exhibited at the Kiev House of Arts at the personal exhibition in 1941. All the pictures from the exhibition burned out during the shelling of Kiev in 1941. He evacuated to Uzbekistan in 1941. Personal exhibition at the Art Museum of Fergana in 1943, presented such works as “A good news”, “The teahouse” (“Chaikhana keeper”), “Singing with a plates,” “Shahimardan”, “A beggars,” “Partisans”, “Farhadstroy”, also portraits and drawings. He held personal art exhibition on military issues in Tashkent in 1945: there was the work “Listening to the radio” among the paintings. This painting was dedicated to the decisive battles of Moscow and Stalingrad. In addition, he was painting a picture related to the tragedy of the Jewish nation: “Action” – “If I forget it” – “Babi Yar” – “The last path” – “In Memory of the Victims of Fascism.” (These are the names of the same picture), “The execution by shooting”. Moved to Riga in 1945, where he finished his painting “Babi Yar”. He created colorful mural “With the victory” in Riga. In 1950 he draws a “Spring winds”, 1951 – “A Hero of our Time”, 1953 – “An old fortification”, 1954 – “Sevastopol Stories”, 1956 – “Labor tribe”, 1958 – “The Road to Calvary”, 1959 – “Taman campaign,” 1960. – “The Story of a real Man” 1962-1963 – “Born by storm”, 1967-1968 – “The heartland”, 1968-1969 – “A Blue Notebook,” 1969 – “A son of the regiment.” In a period of 60s, he joined to the struggle with the Soviet authorities for the right to perpetuate the memory of those who were killed at the Rumbula forest. In 1964, Latvian State Museum of Art held the first major solo exhibition of paintings by J. Kuzkovski in Latvia with paintings “The last path”, “An old house”. “We will live” was painted in 1965, after visiting Fort IX Kaunas . In 1965 – exhibition in Jekabpils, but in Daugavpils – in 1966, presenting portraits of Jeanne and Johanna Lipke, “Shulamith”. In 1967 an exhibition took place in Culture Palace “WEF”. Kuzkovski created the painting “Transistor” (linocut), “David and Goliath” (pastel), “Stepmom” in 1967. 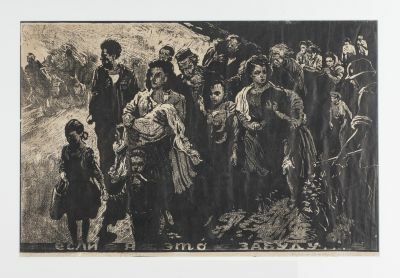 He dedicated linocuts “We will live”, “Hava Nagila” to the Jewish theme (the last mentioned one is kept in the museum “Jews in Daugavpils and Latgale.” The artist has presented these work to Z. Yakub). Another exhibition took place at the Riga Officers House in 1969. At the end of 1969, he immigrated to Israel, where he created the pastel “Simchat Torah in Kfar Chabad,” popular poster “Let my people go,” and painting “The last path”, which is located in Knesset. He also painted portraits and posters. Project “450 years together. Jewish culture in Latvian environment – arts, music, education” Nr.EEZLV04/GSKA/2013/02 is implemented in Latvia and Norway on 01.01.2015.-31.12.2015. The project is granted by 65 677 EUR by Island, Lichtenstein and Norway, mediating by EEZ finance instrument. The project’s total cost is 117 EUR, state co-funding 11 590 EUR, co-funding by Association “Shamir” 11 850 EUR. Major activities of the project are four exhibitions in Norway and Latvia, klezmer (Jewish folk music) concert in Riga and International contest and exhibition of children’s paintings.